On behalf of the Admissions team and our entire community, thank you for your interest in Saint Mary’s College High School. A school rich in history and grounded in the tradition of Catholic Lasallian education, our mission is to educate young men and women who seek to enrich their lives academically and spiritually. At Saint Mary’s College High School, students demonstrate their talents and abilities academically while excelling in the arts and on athletic fields. Drawing from more than 40 different grade schools across the Bay Area, Saint Mary’s is a community of diverse ethnic, economic, and religious backgrounds that truly represents our neighborhood. Saint Mary’s College High School provides a nurturing environment for character development, growth in competence and respect, and responsibility to those in need. 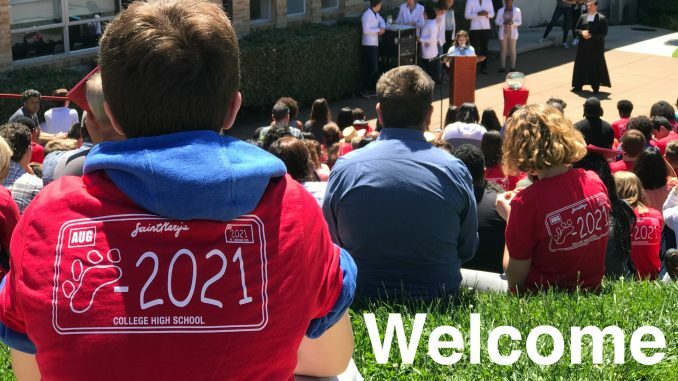 While we hope our online resources provide you with the information you need about Saint Mary’s, visiting our historic campus and admissions events are the only ways to truly get to know and learn about our distinguished history and tradition that makes Saint Mary’s such a special place.